For Norwegian immigrant Arne Kulterstad, a settler in the Mount Horeb area, this snuff box was more than just a gift from one of Norway’s greatest authors. It was a gift from the man who had saved his life. Before leaving Norway, Kulterstad had been found guilty of murdering his landlord when the author Børnstjerne Bjørnson heard of the case. Without Bjørnson’s public appeal for leniency, Arne Kulterstad would have been executed. Instead, he served time in jail before starting a new life in the United States. 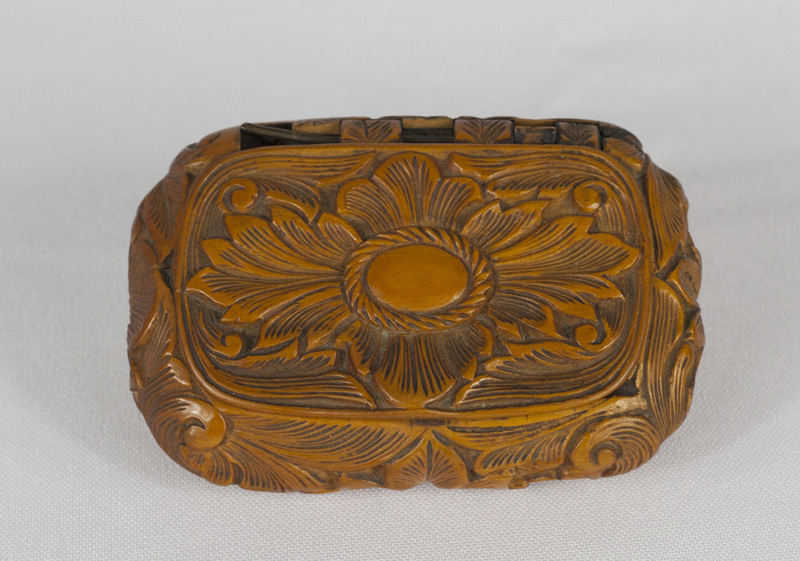 This delicately-carved snuff box, once a practical item for storing tobacco, became a sentimental object with a story to tell subsequent generations. This little snuff box is part of an unusual story of immigration; one which involves a murder, two kings, and the aid of one of Norway’s greatest authors. The immigrant at the center of the story is Arne Kulterstad. He was born to a freeholding family in the mountainous region of Valdres in central Norway in 1825. He was, by all accounts, a rough man. Tall and broad-shouldered, he possessed a nasty temper and was prone to violence, especially when drunk. Kulterstad served for some time in the Norwegian military, achieving the rank of sergeant, before he was dishonorably discharged for insubordination and disorderly conduct. Beginning around 1844, Kulterstad became involved in a feud with a man named Ole Olsen Høiland. Høiland, possibly through suspect methods, acquired the Kulterstad family farm from Arne’s brother at an extraordinarily low price. Arne challenged the sale in court, but the case was denied. Under Norwegian law at the time, when a freeholding farmer retired, they passed on ownership of the land, but continued to live on it under the care of its new owner. In buy the Kulterstad farm, Høiland took on the legal obligation to supply Arne’s parents with an allowance and shelter. Høiland, who was himself regarded as a cruel man, left the elder Kulterstads in poverty and when Arne’s father died, Arne believed Høiland’s neglectfulness had hastened it. Under these circumstances, the animosity between Ole Høiland and Arne Kulterstad grew. These tensions came to a head in 1858. At a public event, a squabble between the two men erupted into a brawl. Høiland, in the presence of the local magistrate, drew a knife on Kulterstad and stuck it through his right hand, permanently injuring it. Kulterstad sought compensation by bringing a lawsuit, but the case lingered in the courts. On November 17th, 1858 Kulterstad was out hunting when he spied Høiland driving his cart to the mill. Perhaps impatient with the lawsuit, Kulterstad fired his rifle at Høiland, striking him in the chest. He had not seen Kulterstad shoot at him, but their well-known feud led everyone to suspect Kulterstad immediately. Nine days after Høiland died from the gunshot wound. Arne Kulterstadt was convicted of murdering Ole Høiland and was sentenced to be executed. The case was appealed to the Norwegian Supreme Court, but the verdict was upheld. At this point, Kulterstad, who had hitherto been silent at the recommendation of his lawyer admitted to shooting Høiland, but asserted he was only attempting to maim the man in retaliation for the injury to his own hand. Kulterstad had been recognized in the military for his marksmanship and was noted for his skill at bird hunting and was thus capable of such precise shooting. However, he contended, a sudden movement by Høiland resulted in the shot hitting Høiland in the back, mortally wounding him. Kulterstad’s confession did not elicit clemency from the courts, as he had hoped, but it did attract the attention of the author Bjørnstjerne Bjørnson. Bjørnstjerne Bjørnson was a member of the Norwegian Romantic Nationalist movement and one of the most prominent literary figures in the county. His works often dealt with and celebrated Norwegian rural life and people. Bjørnson visited the condemned Kulterstad in prison, where on Arne pleaded with the author to help him. Bjørnson began a series of public appeals for leniency, not shying away from Kulterstad’s guilt or unflattering character, but argued that based on the because he did not intend to kill Høiland, Kulterstad, morally, should not be executed. Bjørnson, since witnessing an execution as a child, had been an opponent of the death penalty. The public appeals found a receptive audience and public pressure led to King Karl XV commuting the sentence to life of hard labor. After serving twenty years, Kulterstad’s good behavior in prison led to King Oscar II pardoning him with the condition of exile. During his 20 years in prison, Kulterstad’s children had emigrated to the Blue Mounds area of Wisconsin and he followed them there in 1880. Kulterstad had one more meeting with Bjørnson the following year, when the author was on tour in the United Sates. Bjørnson was staying in Madison and Kulterstad travelled to meet with him. Emotions ran high as Kolterstad thanked Bjørnson and told him he was like a second father to him. It was likely during this reunion that Bjørnson gave Kulterstad this elaborately decorated snuff box. Arne Kulterstad died in 1902, not living to see Bjørnson win the Nobel Prize in Literature in 1903. Kulterstad kept the snuff box as a treasured keepsake until, on his death bed, he passed the box on to the man who wrote his will.